Re: Dec 22 or 23 -- Any interest in El Pescador?? Sorry to hear, Pat. I've read the '15-17s have some shifting issues, but I didn't realize the clutch was a potential issue. I know you and I can attest to how robust the OEM clutch was in the 03 Cobras with the original, heavy clutch. I think the 04s got a slightly lighter pressure plate, if I recall correctly. From what I've read, the 6-speed trans in the '18+ is a big improvement over the previous model. The MT82 in the 2018 model refresh is supposedly improved, but, it has had some well published issues as the shift forks were switched back to aluminum from the steel ones of the prior trans, and some broke. Also the new clutch for the revision has also failed in some cars. I also am not a fan of the sided loading MT82's, as they do not shift as well as a top loading trans, and, you have to take the trans loose and do a lot of work to add any of the shift kits to the car. The internal trans ratios were also changed for the revision, and now, 4th gear is 1:1, while 5th gear is 1:1 in my 2017. Since, to some extent, additional useful gears, as in one overdrive really is sufficient, make for more performance (see the 10 speed auto as an example), and since having a good selection of gears on the road increases driving pleasure, the new trans with two overdrives may not be all that great a change. But, clearly, the manual trans Mustangs have been having assorted issues since at least 2010, and, it appears that Ford is making every attempt to avoid admitting this fact. I will concede that hard use no doubt contributes to failures, but, for a car marketed as a sports car, and a car that has advertisements on TV where they take people to a site and let them smoke the tires using the line lock feature, it would seem that Ford should either drop the manual trans or provide a manual trans that is more robust. In any case, the delays in getting warranty work are widespread, as Galpin said as many as 8 weeks when I checked with them. And, all the Ford dealers are pretty much on the same page. Galpin said that the delay is in large part due to Ford being very picky about initial authorizations to honor the warranty. And, for the 2018, and up, a lack of parts to repair the new trans and/or clutch have been reported. I asked the nice guy at Galpin about issues with the new 10 speed auto, and, he said that it has not been a problem as far as he went. Now, I intend to thoroughly research clutches as perhaps I should simply get an aftermarket clutch assembly and have it installed by other than a Ford dealer. When I factor in a rental car, and the inconvenience of being without my car, and still having to pay for it, as it still needs insurance and tags and it still depreciates, etc., I might get close to a break even point on the cost of an aftermarket solution. And, some say that the real solution for the lousy shifting MT82 is a proper clutch. This may be true as Ford changed the clutch for 2018 for some reason. But, basically, I have been sentenced to prison, or, in my case, home arrest, and no ankle bracelet is even necessary. But, at least, I can take credit for bringing some rain to So Cal, since almost immediately after my cage broke, it rained, and more is forecast. So, my back up, aka the paint shaker, is of marginal value. And, although it theoretically could get to Fillmore, it would not be comfortable or fun, even on a day that was not too cold, as there is too much straight road there and back, and, the paint shaker is not called the paint shaker in error. It might liquefy my arms to ride it that far, not to mention that it would inhibit my Margarita consumption to be riding a motorcycle rather than driving a cage in the dense and always crazed So Cal traffic. So, off to research, but, it is starting to appear that the days of the manual transmission in cages are definitely ending, as autos with many gears, all electronic and tied to the PCM, offer more performance and, also, may well be more robust and durable. 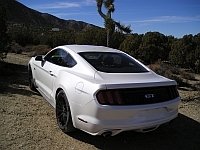 But, the autos drain all the remaining driver input out of the nanny infested new Mustang, which bnasically says that it is programmed to do better than the driver, and, thus, all the driver has to is steer and mash the throttle. No dancing on the pedals, no heal and toe (and the 2018 manual added rev matching so it too does not use heal and toe). Once again, the world and the expectations and desires of its current consumers have betrayed me, as the once simple, and bang for the buck, Mustang, has evolved into a more main line modern vehicle, which, to me, with my old time attitudes, has almost destroyed its appeal and character. And, now, Ford is not even taking care of loyal owners. But, life goes on, and, I am also happy now that I kept the KTM, as, even with winter, if one has to rely solely on motorcycle for transportation, it is hard to beat So Cal as the place to do it. And, I do not notice the shaking too much in town or if I am occupied with a technical stretch of road, as survival commands my attention and the shaking goes unnoticed. But, on any constant speed straights, it shakes like mad, so using the freeway is terrible. It also is geared so short that the big single turns 5000 RPM at 70 mph, and, at common Ca freeway speeds revs run between 5000 and 6000 (84 mph). The engine rev limiter hits at 8000 RPM, so the bike is using a lot of its RPM range just to match freeway traffic speeds. But, at least, it accelerates fairly well at those speeds, as it will run to 100 mph pretty fast, which is my defacto speed limit, although I confess that I tested a couple of times and the bike will hit the rev limiter in top gear at 112 mph (8000 RPM). But, the 690 Duke was never about top speed or blinding acceleration. It is about a bike that is 350 pounds fully fueled, with a low CG, and that has a bit over 60 RWHP. This makes it a genuine terror on tight curvy roads, as there is no substitute for light weight when it comes to flicking a motorcycle around, and you can only use so much power on such roads. But, I digress, as the real point is that I will not be going long distances on the KTM, especially in the winter. I also need a larger back pack, so that I can shop, but, these days, that is as near as the internet, and can be delivered to me. Having lived with only a motorcycle now and then over the years, as I once rode, I am aware that shopping is possible, and hence, I will be able to survive. Still, not what I'd call a welcome Christmas gift from Ford. I think you covered a lot of ground. jhwalker wrote: I think you covered a lot of ground. Sometimes it helps me to put things in writing. I also just hot a JD Power reliability online survey on the Mustang, and, this time I logged onto JD Power's site and took the survey, which, since it concerned reliability, was a perfect place to vent about the failure and the lack of prompt warranty service on a basically new (6318 total miles) car. Even Ford cares about JD Power findings, and, although Ford will not know that I provided a very negative report, it could impact them. But, the new reality for me is that a vehicle bumper to bumper warranty may not be a valuable as I once thought it to be. Well, since those are such awful vehicles, maybe you should sell them. xbacksideslider wrote: Well, since those are such awful vehicles, maybe you should sell them. Are you able to attend lunch? Yes, but will it be the 22nd? or the 23rd? xbacksideslider wrote: Yes, but will it be the 22nd? or the 23rd? It is too late for me, as I am now financially ruined and if I sold my current vehicles, I would not be able to replace them at all with anything of interest, as prices of new machines have continued to soar. A nice new Mustang can easily be $50K+ out the door, with attendant large DMV fees and insurance costs. And, there are not many 350 pound all up, at a max, street bikes out there with nice old school upright riding positions and proper handlebars. So, I have decided that I have no options and I will have to endure the Ford warranty process, which came as a surprise, as in the past I never had to wait two weeks just to have a car get a preliminary inspection at a dealership. Must be a lot of broken Ford products around, as all the dealerships say they are hammered. But, it can't hurt to spread the word about Ford's warranty, as some may not have been aware that it may not be honored in a timely manner, and, this is apparently perfectly OK with Ford, and also legal, as acceptable time frames are not really defined in the warranty. Yep, the regulatory overburden is driving variety out of the market. Less models because DOT/EPA/State permitting costs are incurred per model so less models reduces that cost per unit sold - voila, variety of offerings pinched down to nothing but SUVs, unless you wanna pay. If you had an EXC your bike would weigh a hundred pounds less.